Concrete Solutions and Repairs - Luna and Associates - Specializing in commercial roofing products in Missouri, Illinois, Nebraska, Kansas and Iowa. ISE Logik is pleased to announce the compatibility warranties issued by Taylor for all ISE products. Taylor is the leading floorcovering adhesive manufacturer and manufactures adhesive for a dozen or more major floorcovering manufactures. 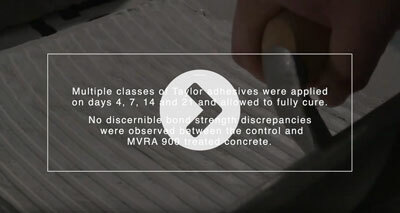 Taylor and ISE conducted extensive tests with all types of indoor adhesives within the industry at the Taylor technical center in Dalton, Georgia, and no bonding issues or compatibility issues were evident. ISE had already conducted these types of tests prior to marketing our product, and continues to conducted compatibility tests with adhesives as new adhesive products come to market, which is one of the reasons why we are confident in issuing an adhesion warranty for each project. The Taylor compatibility warranty reinforces that and adds an additional layer that no other admixture company in our sector has. This is significant and an irrefutable benefit for the project team employing MVRA 900 admixture instead of our competitors products, since the leading floorcovering adhesive company confidently issues a compatibility warranty with ISE’s product but does not with any of our competitors. Check out ISE Logik’s website. SealBoss ® Corp. International Specialty Construction Product Systems, Geo Technical Products, and Equipment for infrastructure and geotechnical applications. Concrete repair, crack injection, water stop technology, slab lifting, floor joint and spall repairs, surface sealing, bonding, soil stabilization and consolidation. Commercial, residential and natural structures, e.g. tunnels, bridges, dams, mining, high rises, parking structures, water treatment facilities, warehouses, basements, pools, etc. SealBoss – over 50 countries, international distribution networks including UK, Australia, NZ, Baltics, India, Korea, Singapore, Mexico. SealBoss ® Corp. is ISO 9001:2015 Certified.